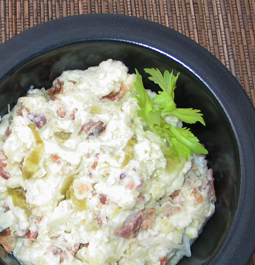 Sauerkraut Mashed Potatoes with Bacon - A recipe from Savor California, the online showcase for extraordinary gourmet foods and beverages from California. Peel potatoes and boil in salted water (along with cumin seeds, if desired). Drain and mash potatoes. Set aside. Cook bacon until crisp. Drain, reserving 2 tablespoons bacon fat. Crumble the bacon. Heat sauerkraut separately and drain. Combine potatoes and sauerkraut. Add milk. Add bacon. Pour fat over and mix it in. Note: If you don't want to use bacon fat, season the potatoes to taste with salt. Serve with roast pork, ham, or any smoked meats.